For questions about our Board of Directors, or to send a message to a specific Board Member, please get in touch with us. Select the Board of Directors category when you complete the contact form. Formed in 2004, Calista Corporation’s Shareholder Relations Committee is comprised of five members from the Board of Directors. 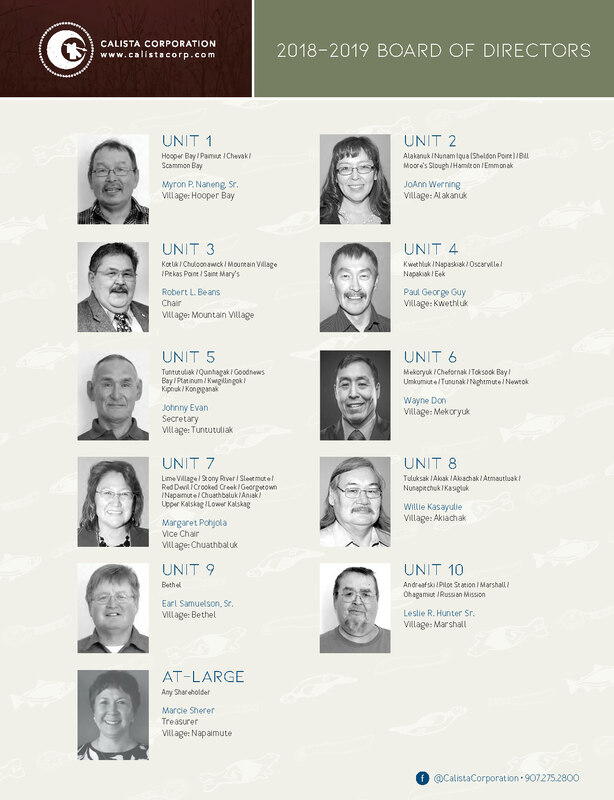 Each year, generally in the first and fourth quarters, they travel to communities around the YK Delta to provide updates on Calista’s operations and activities. One or two staff members usually join the committee. This section will be updated when tour dates are confirmed. Members of Calista Corporation’s Board of Directors are elected by Shareholders to provide guidance to the company on a variety of matters. Their duties include the responsibility of hiring and reviewing the performance of the company’s president/CEO, establishing broad policies and objectives, approving budgets and ensuring the availability of adequate financial resources. Elections are held annually, with the final count of votes determined by an independent Certified Public Accounting firm at the annual meeting. Terms last for three years. Board of Director candidate solicitation generally opens a few months before the Annual Meeting of Shareholders, with the deadline for candidate solicitation announced at that time. To learn exactly when candidate applications are accepted, please watch for the Storyknife newsletter announcement, special mailings and/or announcements online such as on the Calista Facebook page. To ensure you are notified of candidate openings, please provide Shareholder Records with your current contact information. Calista Board of Director candidates must be at least 18 years old and must be a Calista Corporation Shareholder.